LaGrange Toyota’s Service Center understands that the right set of tires is crucial for handling, traction, and efficiency. When the right tires are on your Toyota, you can start, corner, and stop with confidence. Tires with sufficient tread help you handle a variety of road conditions and help you avoid wheel spin or hydroplaning; however, tires that are worn out will produce an uneasy ride, make noise or vibrations, and can cause your fuel mileage to suffer. Regardless of where you’re driving, tire tread is grinded away every time you’re on the road, so when you notice your tires wearing, come see our Service Center. Our tire specialists will find the perfect fit you need for your Toyota, and not just any tires will do for your vehicle. 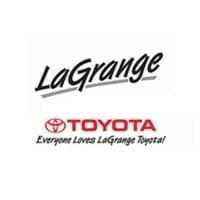 The Toyota of LaGrange Service Center carries high-quality tires from the brands that you know and trust. We carry BF Goodrich, Bridgestone, Dunlop, Firestone, Good Year, Michelin, Uniroyal, and Yokohama ‐ just to name a few. Our factory-trained and certified Toyota technicians will make sure they’re mounted and balanced perfectly. When you need excellent tires and superior service, trust LaGrange Toyota’s Service Center to get the job done.